AMONG THE MORE DISTINGUISHED BEASTS OF PREY. 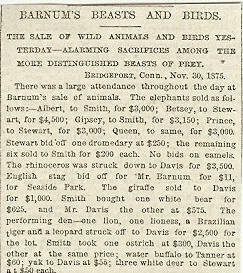 There was a large attendance throughout the day at Barnum's sale of animals. 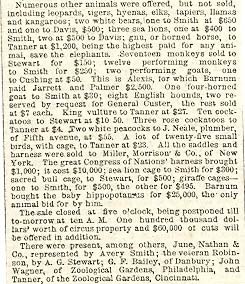 The elephants sold as follows: Albert, to Smith, for $3,000; Betsey to Stewart, for $4,500; Gipsy to Smith, for $3,150; Queen to same, for $3,000. Smith did on one dromedary at $250; the remaining six sold to Smith for $200 each. No bids on camels. The rhinoceros was struck down to Davis for $3,500. English stag bid off for Mr. Barnum for $11, for Seaside Park. The giraffe sold to Davis for $1,000. Smith bought one white bear for $650. and Mr. Davis the other at $575. The performing den-one lion, one lioness, a Brazilian tiger and a leopard struck off to Davis for $2,500 for the lot. Smith took on e ostrich at $300, Davis the other at the same price; water buffalo to Tanner at $60; yak to Davis at $55; three white deer to Stewart at $50 each. Numerous other animals were offered, but not sold, including leopards, tigers, hyenas, elks, tapirs, llamas and kangaroos; two white bears, one to Smith at $650 and one to Davis; gnu, or horned horse, to Tanner at $1,200, being the highest paid for any animal save the elephants. Seventeen monkeys sold to Stewart for $150; twelve performing monkeys to Smith for $250; two performing goats, one to Cushing at $50. This is Alexis, for which Barnum paid Jarrett and Palmer $2,500. One four-horned goat to Smith at $30; eight English hounds two reserved by request for General Custer, the rest sold at $7 each. King vulture to Tanner at $27. Ten cockatoos to Stewart at $10.50. Three rose cockatoos to Tanner at $4. Two white peacocks to J. Neale, plumber of Fifth avenue at $55. A lot of twenty-five small birds, with cage, to Tanner at $23. All the saddles and harness were sold to Miller, Morrison & Co. of New York. The great Congress of Nations harness brought $1,000; it cost $10,000; sea lion cage to Smith for $300; sacred bull cage to Stewart, for $500; giraffe cages one to Smith for $500, the other for $495. Barnum bought the baby hippopotamus for $25,000, the only animal bid for by him. The sale closed at five o:clock, being postponed till to-morrow at ten A. M. One hundred thousand dollars; worth of circus property and $60,000 of cuts will be offered in addition. 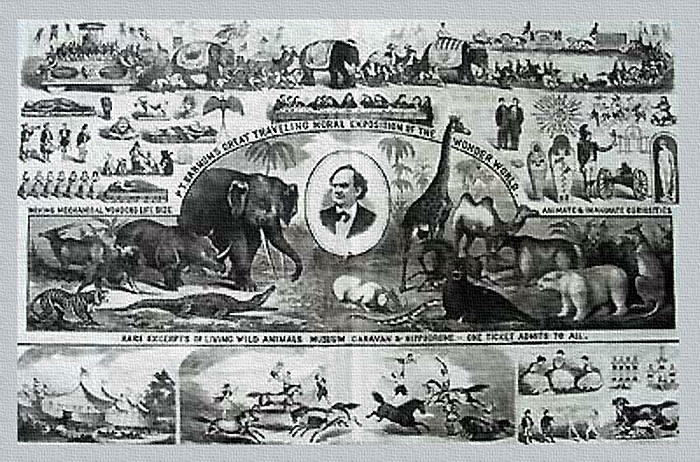 There were present among others, June, Nathan & Co., represented by Avery Smith; the veteran Robinson by A. G. Stewart; G. F. Bailey, of Danbury; John Wagner of Zoological Gardens, Philadelphia, and Tanner, of the Zoological Gardens, Cincinati.